Looking For Sodablasting Equipment in Texas? Looking for a Professional Blasting Service? The Buster Blaster 100 is the only true Soda Blaster. It operates using a patented, self-cleaning venturi that requires little or no maintenance. The venturi combined with the metering system in the Buster Blaster soda blaster virtually eliminates downtime because of clogged lines and will deliver a precise and even flow of the blasting medium (Natrium Soda Blasting Medium) so you can complete your work on-time and on budget. A properly adjusted Buster Blaster soda blaster will reduce your use of soda by 20% and still have better on- the-job performance than any modified Sand Blaster. The Buster Blaster model 100 soda blaster has a capacity of 100 lbs of Natrium Soda, that's two bags. When you order the Buster Blaster 100 soda blaster you should already have a high-volume air compressor. How much capacity do you need? It depends upon the size of the nozzle you are using. When you are using a nozzle with a larger opening, you increase the flow of air and soda and have a larger "brush" to blast with. Our Buster Blaster 100 Mobile unit comes with an air compressor that has a capacity of 210 CFM at 150 PSI It can supply enough air to run two Buster Blaster Soda blaster pots with 1/4 inch nozzles. Another very important factor to consider when Soda Blasting is the dryness of the air. It is essential to supply the driest air possible to your soda blaster. Sodium Bicarbonate is hydrophilic, it loves water. It will readily absorb any moisture it can find in the air supplied to it. This leads to clogged lines and poor performance. At Soda Works we have been aware of this for years and have developed our proprietary air drying system which consists of our custom air cooling unit coupled with our SW-500 moisture separator. We have spent years perfecting this system to deliver the driest air possible to our Soda Blasters. If you have your own high-volume compressor and are ordering one or more of our Buster Blaster soda blasters, be sure you also order our fan cooler pack which will deliver the dry air you need to soda blast in the efficient and profitable manner that our soda blasters make possible. The Buster Blaster 100 Mobile Unit is the Ultimate Soda Blasting product. It is our own patented, custom designed system that will give you the very best soda blasting results period. There is no other system out there marketing itself as a "Soda Blaster" that can come close to the Buster Blaster system. Designed from the bottom up for soda blasting only, our system will complete more trouble-free work in less time using less soda. 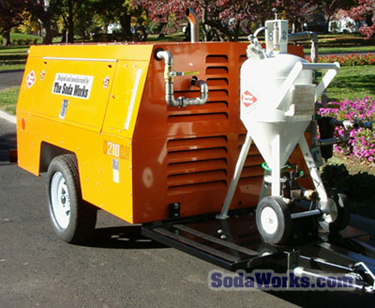 Our complete Soda Blasting system is built around a Sullivan High Pressure air compressor. This compressor is driven by a 78 horse power John Deere diesel and can output 210 CFM at 150 psi. The compressor is trailer mounted so you can simply hitch it up and haul it to your job site. The air from the compressor is then run through two of our rear-mounted coolers. Cooling the air is a preliminary step to removing the moisture. If there is any moisture in the air you use to soda blast, the soda will clump and the blaster will jam. After the air is cooled it is run through our proprietary moisture separator. When it has passed through this stage the air is ready for the soda blasting pot. But before we send the air to the pot we tap into the line with a regulator that many of our customers use to feed respirators. Soda Blasting can be dirty work, no need to breath all of that. The cooled, dried air then is delivered to one of our Buster Blaster 100 soda blasting pots. We've said it before and we are saying it again, The Buster Blaster is the only true Soda Blaster. It operates using our patented, self-cleaning venturi that requires little, if any, maintenance. The patented venturi valve, combined with our optimized metering system, virtually eliminates clogged lines and delivers a precise, even flow of the blasting medium. Our Mobile unit is delivered with one soda blasting pot mounted on the trailer, but the system is designed to be able to provide enough air to keep two soda blasting pots in operation. The Buster Blaster Mobile unit is truly a turn-key business opportunity. As your workload increases you can simply add another soda blasting pot and you can set another employee to getting the task completed in half the time! 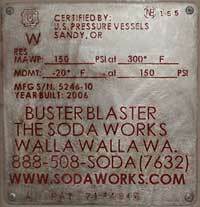 Each Buster Blaster model 100 soda blasting pot has a capacity of 100 lbs of Natrium Soda, that's two bags. Sullivan Hi-Pressure 210 CFM, Max 150 psi. Don't short change yourself. The Buster Blaster 100 Mobile Unit is the only soda blasting system designed from the ground up just for soda blasting. From air delivery to soda delivery, there is no other system that performs like the Buster Blaster 100 system. There is no other system that is as maintenance and trouble free as the Buster Blaster 100 system. There is no other system that uses the blasting medium as efficiently and effectively as the Buster Blaster 100 system. Three year warranty on cooling coil (except puncture and freezing). The Buster Blaster 100 is the only true Soda Blaster. It operates using a patented, self-cleaning venturi that requires little or no maintenance. The venturi combined with the metering system in the Buster Blaster soda blaster virtually eliminates downtime because of clogged lines and will deliver a precise and even flow of the blasting medium (Natrium Soda Blasting Medium) so you can complete your work on-time and on budget. A properly adjusted Buster Blaster soda blaster will reduce your use of soda by 20% and still have better on-the-job performance than any modified Sand Blaster.